Emergency personnel transported three people to the hospital Tuesday afternoon following a two-vehicle collision at the intersection of Gentle and Framingham roads. LITTLETON, Maine — Emergency personnel transported three people to the hospital Tuesday afternoon following a two-vehicle collision at the intersection of Gentle and Framingham roads. Tessa Winship, 21, of Houlton was traveling north on the Framingham Road in a 2000 Volkswagen sedan shortly after 3 p.m. when she attempted to make a left-hand turn onto the Gentle Road, according to Acting Aroostook County Sheriff Shawn D. Gillen. At the same time, Joshua Kennedy, 24, of Littleton was driving east on the Gentle Road in a 2005 GMC pickup truck when Winship’s vehicle crossed into his path and the vehicles collided, Gillen reported. Both operators, as well as a female passenger in Winship’s vehicle, were transported to Houlton Regional Hospital to be treated for injuries that were not considered life threatening, according to police. 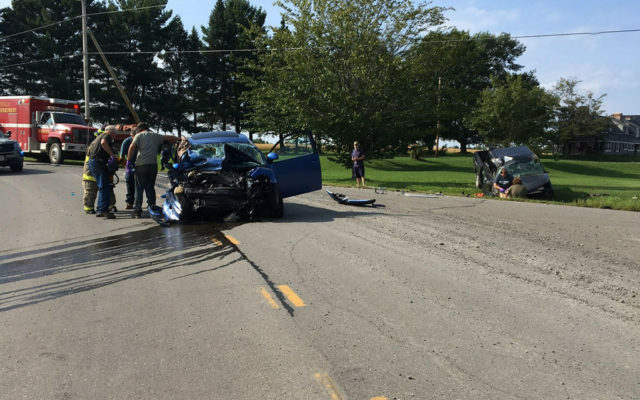 Members of the Monticello Fire Department responded and used extrication equipment to remove the passenger, who was not identified, from Winship’s vehicle. Due to extensive damage, both vehicles had to be towed from the scene. Deputy Richard York responded to the crash, which remains under investigation. Gillen said he would not know for a couple of days whether any charges would be filed.